Maintenance means keeping the mechanism functioning and preventing corrosion. Powder fouling (“carbon”) does no harm and needs to be removed only so that it doesn’t impede function. Apply a bit of solvent, such as RBC (Rifle Bore Cleaner) or Hoppe’s #9, brush the part, leave set for a few minutes and wipe off. This may not remove it all but will get enough carbon to remain functional. That is your goal. There is no real need to strip off all the carbon and it may be counter productive, especially if you are reduced to using harsh degreasers or unauthorized metallic scrapers. Light lubrication should remain to prevent wear and corrosion. Many lubricants have a mild detergent that will bring tiny amounts of fouling out of the metal’s pores. Thus, a wipe of the finger will show residue. This is GOOD! It means there is lubricant protecting the metal. Proper maintenance should take ten minutes, usually less. Review the Technical Manual (or read for the first time) and confirm what I’ve written. If you don’t have a TM handy Armalite published a report (Armalite TECHNICAL NOTE 29, RIFLE CLEANING) for AR-15 type rifles but it applies for nearly any military or civilian firearm. So why are Soldiers and Marines suffering through extended cleaning sessions, stupidly scraping away parts, using overly-harsh solvent tanks and destroying perfectly good weapons in the process? Personnel assigned in an armorer slot rarely are actual, trained armorers. Instead, the unit armorer is an NCO of sufficient rank to be entrusted with arms room keys and assigned an extra duty. In the Army, the person may be a 92Y (Unit Supply Specialist) so handling firearms is just another inventory task. And to top it off, even formally trained military armorers are more likely to be parts changers, not gunsmiths or marksmen. The crime usually goes down like this. PVT Joe Snuffy is tasked to clean weapons. We’ll pretend Joe actually bothered to read the TM (Technical Manual) and found that he only needs to brush and/or wipe away any obvious corruption, put a thin wipe of CLP over the metal surfaces and lightly lubricate the moving parts. In ten minutes he’s performing a function check and ready for turn in. This frustrates Joe and rightly so. This Private actually glanced at the relevant TM within the past five years instantly making him more qualified than this “armorer.” However, Clueless is four pay grades above Joe and in charge of the arms room, so Joe loses. Joe swabs away on his already maintained weapon. He gets pipe cleaners, cotton swabs and starts into every little nook and cranny to clean everything. Thirty minutes later Clueless rejects it again. An hour later Clueless does his white glove treatment. The bone dry, unpreserved, unlubricated, scraped parts have had any remaining protective finish scratched away. There is nothing there now but bare, unprotected metal. In addition to the real damage caused and the increased likelihood of rust and corrosion during storage, this also sets the stage for a string of malfunctions next time the weapon is used during qualification. Of course, this will be blamed on how “unreliable” the M16/M4 or M9 is. Any attempted remedy will happen hurriedly on the firing line and involve a large amount of CLP pumped aimlessly into the hapless weapon. But, for now, Clueless seems content so Joe is happy. 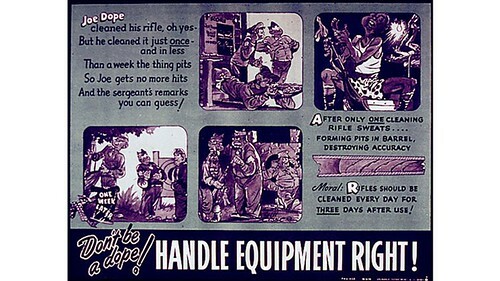 And that is how the Army cleans guns, Joe learns. Years later, Joe reclasses as 92Y, is entrusted with the arms room and ready to pass on the “lessons” SSG Clueless taught him to other soldiers and civilian shooting pals. I was in the Corps from 87′ to 91′ and worked in the armory as a custodian for our unit for my last year and a half before i got out. Our goal was to have the weapons turned in and visibly clean from any obvious use. If they were shot, we wanted them clean enough that if you stuck your finger in the chamber you didn’t pull it out full of carbon. A lot of the times when the unit came out of the field and just turned in the weapons to us, they just got a brushing of clp with the oil brush and turned in. The next day the platoons normally came down and gave the weapons a thorough cleaning. There were times when marines would take wire brushes to scrape off rust on the barrels of the beretta 9mm’s and times when they would take the rear sights apart on the M16’s and lose the bearing or spring, and they would sometimes take the flash hider off or the front sight post and lose parts there also. It was unbelievable the things some of them would do to try and get the gun cleaner than it needed to be. Especially when they didn’t have the tools to properly work on it and put it back together. Fortunately our cage was next to the battalion armorers and we got along with them. They would usually fix the problems for us if we asked. Most fo the times the marines that lost parts didnt get in trouble for it so there was no use in complaining about it to the XO. It was just part of the job. It was frustrating at times, but a great job overall. Another good example. You were lucky the armorers were next door!